Chief Gary Ludwig, MS, EMT-P is an EMS and fire expert with more than 41 years of experience in EMS, fire, and rescue services - with over 39 years as a paramedic, and more than 20 years of consultation and expert witness work. Chief Ludwig provides consultation and expert witness services for professional attorneys and governments involved in civil and criminal litigation. He is the incoming President of the International Association of Fire Chiefs. Gary Ludwig provides expert witness opinions, litigation support and consultation on emergency medical service, fire, and 911 matters to plaintiff and defense attorneys, risk management professionals, as well as the general public. 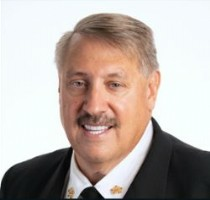 Gary Ludwig is recognized as a respected national fire and EMS author, public speaker, and expert who has managed two award-winning metropolitan EMS systems (Memphis and St. Louis) and has pioneered many concepts which are now standard practice in fire and EMS systems today. Chief Ludwig has over 41 years of fire, rescue and EMS experience - and over 39years experience as a paramedic. He currently serves as the fire chief of Champaign, Illinois and is the 1st Vice President of the International Association of Fire Chiefs. Recently, Chief Ludwig retired as a deputy fire chief on the senior command staff for the Memphis Fire Department (Tennessee). The Memphis Fire Department is a 1,987 person fire department, operating from 57 fire stations, a $162.5 million budget, and last year responded on approximately 145,000 alarms. The EMS budget is over $36 million. Chief Ludwig previously retired as the Chief Paramedic from the St. Louis Fire Department in 2001. He was employed full time with the City of St. Louis for 25 years after starting employment with the City two months out of high school. During his career, he rose through the ranks and managed various programs or Bureaus including field operations, support services, and the Fire Alarm Communications Center. Chief Ludwig is the 1st VP Elect of the International Association of Fire Chiefs (IAFC). He has been a member of the IAFC for 25 years and previously served on the EMS Section Board for 22 years and served as Chair for six years from 2007 - 2013. Chief Ludwig has earned a Bachelors degree in Business Administration and a Masters degree in Management and Business. Additionally, he is a licensed paramedic and a certified firefighter. Chief Ludwig is also a contributing editor and writes a monthly column that appears in Firehouse Magazine. Over 20 years of experience as an expert witness and consultant. Mr. Ludwig has been invited to speak or deliver a keynote address at more than 250 professional conferences and seminars in 42 states including Fire-Rescue International, Fire-Rescue Med, Fire-Rescue East, EMS Today, EMS Expo, EMS Magazine Expo, Firehouse Expo, Fire Department Instructor's Conference (FDIC), Firehouse World, FireCon, plus many other local, statewide, national, and international conferences and seminars. Over 500 published articles in such magazines as Firehouse, Journal of Emergency Medical Services, EMS World, Fire Chief Magazine, 9-1-1 Magazine, and On-Scene; Articles are available upon request.